We've all had the experience of reading a good book or watching a good drama and for a while assuming some aspect of one of the characters. Maybe we pick up a new expression or a new way of dressing; maybe we pick up a swagger or an intriguing opinion. It feels good to explore the new viewpoint. In our hearts we know it's only play-acting and soon our real self reappears, but what if...? On the negative side, most of us have had the experience of recognizing some aspect—from someone we didn't particularly admire—as part of our self. Maybe we catch ourselves treating a child like someone once treated us or expressing an opinion whose only basis is that we resisted it when we heard somebody else express it. Even more alarming, we may discover we have the same illness or infirmity of body that some other person we knew had—some other self we may not have treated as well as we should have. And try as we might to suppress this resisted aspect, it reappears, but what if...? When we begin to study what is known about the structure of the self, we find it consists of preferences (beliefs) and a relative time-space location from which the preferences are asserted. The preferences are like the semi-transparent overlays that turn the white light of a projector into an image on a screen. Some of the overlays we cannot easily remove because they contain a forgotten recording of events that automatically assert the overlay as the ONLY choice. The image projected through these overlays onto the screen is sensed as, "Here I am, this is me." ...who would turn their back when the gift of standing at the helm of life is offered? Most of this is pretty standard phil-ligion-ology (PHIL-osophy, reLIGION, psych-OLOGY) and is understood by most of the more clever schools. But since each school is subject to its own belief system overlays, there are wide disagreements as to which overlays are preferable. A common denominator is that almost every school will argue for some and against others. The goal of installing, removing or modifying the overlays is the principal task addressed by most of the doctrines, scriptures, or technologies generated by these schools. The means differ (as well as which overlays are to be addressed), but the determination to change something is remarkably analogous. The most basic means of modifying an overlay, and probably the least dangerous, consists of reacquainting the individual with the recordings of forgotten events that are causing him to assert the overlay. The hope is that he will draw new conclusions and alter his own overlay, thereby achieving a change in self. The major difficulty with such an approach is illustrated by the fact that when white light is projected through both a blue overlay and a yellow overlay, it will appear on the screen as green. If we determine to eliminate the green light, we will probably go looking for a green overlay which in this case doesn't exist. If the green light represents a psychosomatic illness or a state of depression or an unacceptable behavior, we might have some difficulty in locating the exact combination of overlays that is responsible for the condition's creation. This stumbling block has left many of us wishing that we could remove all the overlays, insuring that the condition is eliminated. Then on a blank screen, we could replace selected overlays to generate the self that would interest the people we wish to attract, or to generate the self that would align with what we want to achieve—deliberately creating ourselves. And literally, that is what The Avatar Course allows us to do. One of the results we experience on Avatar is the ability to closely approach identityless-ness. In other words, to experience a self that is without aspect or location. That state is true self, the AVATAR. It is an enlightening, an in-every-moment ability, to make any choice or none, to select our own overlays. Avatar offers us the opportunity to create the image of life that we prefer. The first task we face as new Avatars is to integrate the efforts that have previously obstructed our choices. The world obligingly presents them. To many of us, this integration is an even greater challenge than the exercises on the course, but who would turn their back when the gift of standing at the helm of life is offered? 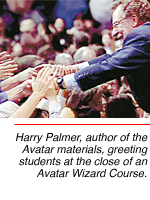 Could anyone have ever dreamed what an incredible opportunity the Avatar materials present?